Fredericksburg was settled by families emigrating from Germany in 1846, led by John O. Meusebach. Many of the buildings in town retain traditional German styles with most of Main Street along with the parallel streets comprising the National Register Historic District. You can still hear German spoken and the old customs are still observed. A few of the customs still observed include Easter Fires, Schuetzenfests, Oktoberfest, Weihnachten, and Kinderfest. Why do visitors choose Fredericksburg for their Texas family vacation? We hear lots of reasons, including the beauty of the countryside and European atmosphere, along with hunting, some great Texas hiking, bakeries, wineries and the wonderful museums plus the state and national parks and the ongoing events and festivals. Fredericksburg is the birthplace of Fleet Admiral Chester W. Nimitz, Commander in Chief of the Pacific Fleet during World War II. The Nimitz museum and Museum of the Pacific War are fascinating reminders of the importance of this war and the people who fought in it. About 40% of all Texas peaches are grown in Fredericksburg and surrounding Gillespie County with more than 60 orchards located in the county. The peach season generally runs from late May through early August. Beyond Fredericksburg and the Texas Hill Country which is just a little over an hour drive from Austin and San Antonio lies the towns of Kerrville, Comfort, Hunt, and Ingram. They are also well known for their wonderful bed and breakfasts, guesthouses and inns. Visitors also find wonderful shopping in and along our wide Main Street filled with antiques, gifts, fashion, books, food, vineyards, wineries, day spas, golf and even lavender farms! The Fredericksburg area has quickly become known for bicycling and bird watching in the hills. The choices in restaurants is diverse and ample – everything from German, Mexican, seafood, and sandwiches. Fredericksburg has been named in Guideposts Magazine as one of the top 10 small towns in America and named as one of five “art towns” in the Southwest by Southwest Art Magazine. Special attractions in and around Fredericksburg are: The National Museum of the Pacific War, LBJ State and National Historic Parks, the Pioneer Museum, Enchanted Rock State National Historic Park Natural area, the Old Tunnel Wildlife Management area, Marktplatz, Luckenbach, Wildseed Farms, Fredericksburg Herb Farm, Butterfly Ranch, and art galleries. Gillespie County and the Texas Hill Country are the second largest wine destination in the United States. 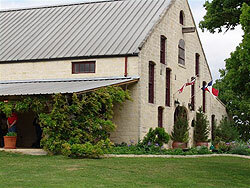 There are over two dozen wineries and tasting rooms in the Fredericksburg, Texas area. Dozens more are within an hour’s drive of Fredericksburg. Craft Beer in Texas is booming! Nationally, an average of 1.5 new breweries opens every day. Fredericksburg is home to two breweries, and a third is on the way. There are another dozen or so breweries within an hour’s drive in Dripping Springs, Johnson City, Blanco, and Marble Falls. Hye, Texas is home to Garrison Brothers Distillery, and there are a few more in nearby towns. Fredericksburg also has Presidential history! President Lyndon Baines Johnson played along the banks of the Pedernales River and, during his presidency; his ranch became the Texas White House. At the Lyndon B. Johnson National Historical Park on Hwy. 290 in Stonewall you can tour the ranch, Texas White House, LBJ birthplace, Johnson family cemetery, old Junction School, LBJ’s grandparents’ house and ranch show barn. Also located on the Lyndon B. Johnson National Historical Park Grounds is the Sauer-Beckmann Living History Farm. Visit a living history farmstead of the pioneers. See how the farm families of a century ago lived. Learn about seasonal activities such as sausage making, sheep shearing, canning, etc. Funtabulous family-friendly entertainment at the Rockbox. A totally new experience for Fredericksburg – professional resident cast presents costumed and choreographed live variety music productions from the golden era of rock n roll. Every weekend in a state-of-the-art, 392-seat indoor theater. The Friends of Gillespie County Country Schools are former students and members of the community, interested in preserving the traditions of the rural schools of Gillespie County. These schools were places for learning and centers of communities which no longer exist, but today continue the traditions of schools in rural areas serving as community centers for the surrounding residents. Today, several properties are in need of preservation and the Friends have taken on the responsibility to preserve and ensure that these former schools will be the future parks for the residents of the county. There are a number of fundraisers throughout the year, including the annual Open House in April, when several of the schools are open to the public. While the city of Fredericksburg is the star of the Texas Hill Country, it is also home to the many talented stars that make up the Fredericksburg Theater Company. See exciting re-creations of popular Broadway shows, Shakespearean plays and even homegrown productions destined to become classics themselves at this greatly acclaimed regional theater. Tickets can be purchased online or from the box office (888)669-7114. The Steve W. Shepherd Theater is located at 1668 Hwy 87 South, 1.5 miles south of Main Street. Luckenbach Texas is a Texas state of mind, where you can kick back, relax and get away from the hustle and bustle of everyday life—like a step back in time. This tiny hill country hamlet where “Everybody’s Somebody” was established as a Trading Post in 1849 making it one of the oldest settlements in Gillespie County. In 1970. Luckenbach was purchased by a collection of only-in-Texas characters—Hondo Crouch and his cohorts, Guich Koock and Kathy Morgan. Today, Luckenbach reflects an eclectic mix of its early history, the larger than life persona of Hondo and an unrivaled legacy of great music that makes us feel that everybody is indeed somebody in Luckenbach.